UNITEX Cargo Services Inc team is a group of professionals in a freight forwarding industry with extensive knowledge in each aspect of this business which makes our company so successful and one of the best on this market. Each one of us strives to deliver the best service possible to keep our clients happy. Our values are the foundation of our company. 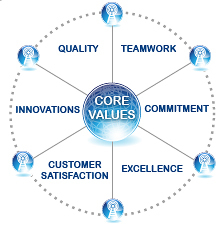 In our every-day work we are always guided by these values making our customers satisfied and serving freight forwarding industry. Quality is a cornerstone of all of our activities. We strive to be the best at what we do - both as a company, and as individuals. Regardless of the complexities of the tasks we always work as one team to find a solution - the best one. UNITEX Cargo Services always respected its values and consequently is committed to their needs of its clients. We create value through a high performance team culture and provide a colloborative, supportive work environment where employees are encouraged to reach their full professional potential. Our customer comes first in everything we do. We follow through on our promises, using teamwork and integrity to respond to and satisfy needs of our customers and to exceed their expectations. Our professionals always pursue new ideas in moving the freight and use innovative ways to enhance our operations and bring value to our customers.